It’s never easy replacing something that has been in place for a while, but with the speed of networking and programmability accelerating it is important to have the right technology in place. In the past, the ConfD confdc tool has used the pyang tool “under the covers.” Several versions ago of ConfD, we moved to a new tool called “yanger” as it delivers significant improvements to performance. A deprecation notice for pyang was included in ConfD 6.5 and, as of ConfD 7.1, pyang will no longer be included in the ConfD distribution. 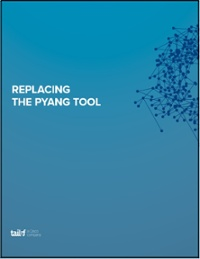 If you have been using pyang directly, read our latest application note “Replacing the pyang Tool” to understand the alternatives to using the pyang version which used to be distributed with ConfD. We are only a few short weeks from the MPLS+SDN+NFV World Congress being held in Paris. The event will focus on Automation, AI deployments in IP/MPLS networks, and where AI is actually being used today. This is a big question for service providers and major enterprises that are moving at light speed to meet their customer's service and application needs. Tail-f is excited to exhibit at this year’s event in booth #207. Stop by and see what’s new and learn how programmability will help solve the market's needs in delivering services where and when they are needed. We have spent the past few months writing about and discussing the need for interoperability testing within virtual and physical network devices. Validating that your devices are interoperable is critical to any network element provider’s success in 2019 and beyond. The two weeks of EANTC multi-vendor interoperability testing which wrapped up in Berlin last week did just that by offering a tangible, lab-validated testing environment. Participants were able to prove that their solution delivers advanced IP/MPLS, SDN, microwave and/or mobile network clock synchronization, as well as NETCONF and YANG interoperability. We are excited to have been part of this interoperability event and are looking forward to the publication of the EANTC report on the results of the testing at MPLS+SDN+NFV World Congress in early April. The pyang utility tool has previously been part of the ConfD distribution and used as part of the ConfD toolchain. ConfD 6.5 included a deprecation notice regarding the inclusion of pyang in the ConfD distribution. As of ConfD 7.1, pyang is no longer included in the distribution. If you have been using pyang directly from the ConfD distribution, learn about your alternatives.